How can I undo a chain that is closed with a master link? I use a tool made out of a steel wire clotheshanger to squeeze the two pins together and open the link. 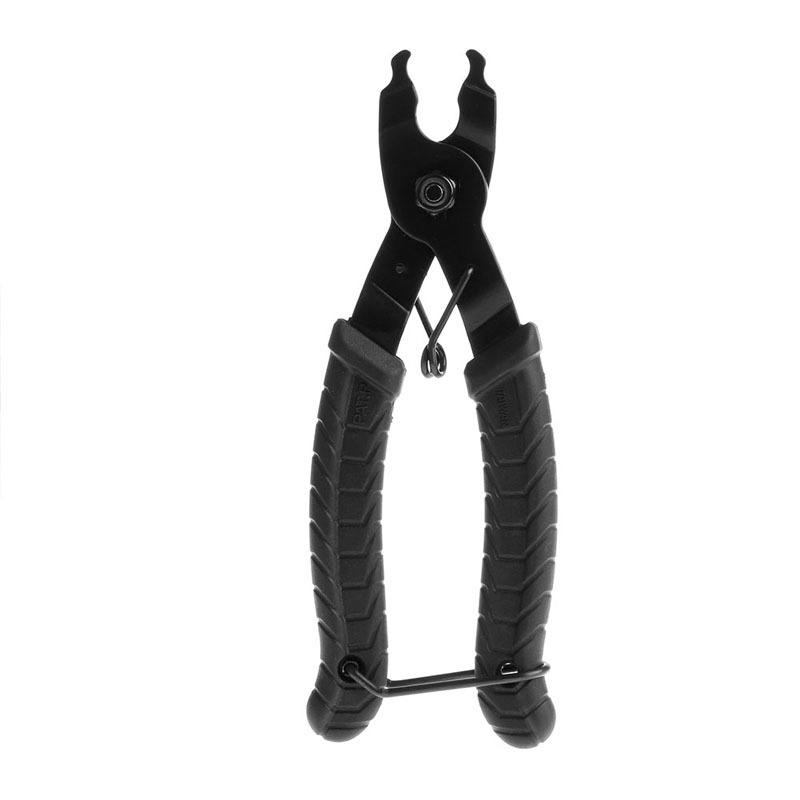 Also, that one hanger turned into three tools: the link opener, a tool to hold the ends of an open chain together, and one to hang the cleaned-and-drying chain from the tree over the driveway. 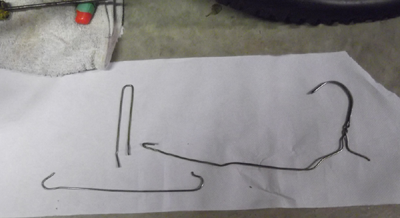 Opening this style requires pressure between the two pins, parallel to the length of the chain. It is possible to open the link without the "special tool" that Criggie's answer uses. 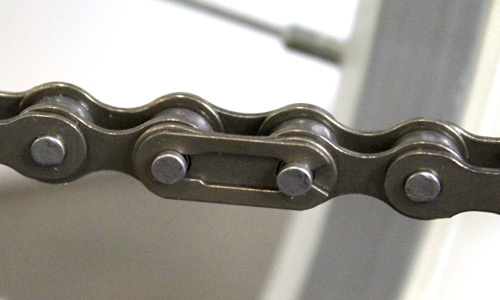 The trick is to get the chain loose/slack so you can fold it back on itself such that the master link is at right angles to the two adjacent links. Then you use a regular pair of pliers, held at an odd angle (helps to contort your mouth as you do this), to apply pressure to the two plates in opposite directions. There are other sorts of master link too. If you have one like this then the outer plate needs to be driven or levered off. The pliers above won't help. This answer could do with more info, feel free to edit. I used one like this years ago. Putting a large flat blade screwdriver in the opening shown and twisting would open the right end enough to slide the plate to the left and remove it. 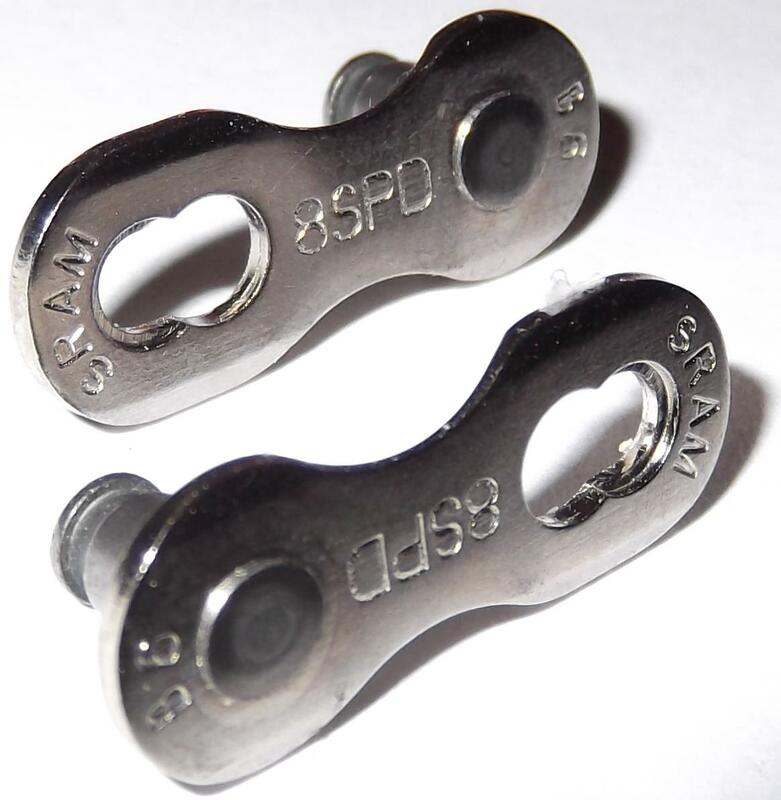 Then the rest of the link could be removed by sliding the pins out of the chain. To reinstall push the pins through the other two links then slide the plate on from the left. A small flat blade screwdriver supplied enough force on the left end to do the job. 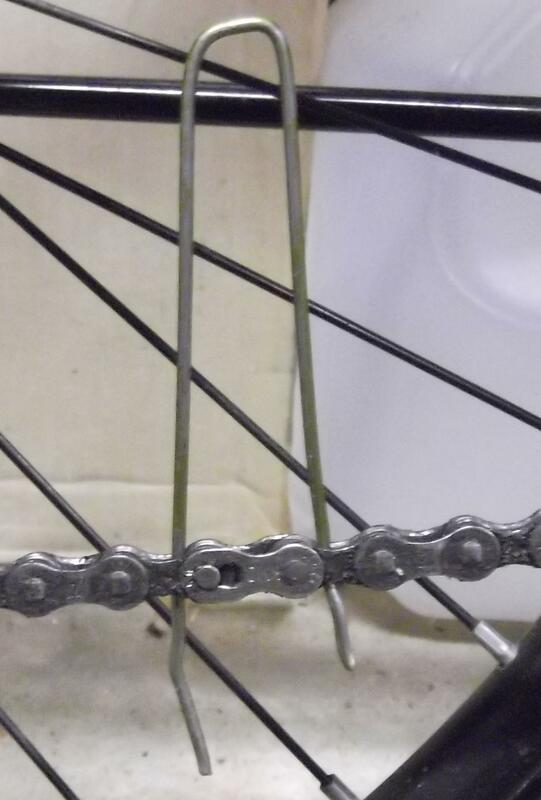 On a well maintained, clean chain you might be able to do this by hand. Full sequence here.Note that nose pliers / needle nose pliers are not necessary; any pliers will do where the jaw tip is narrow enough to sit on the pins of the chain. Also note that some quick links are not meant to be re-used indefinitely. If you have a SRAM Powerlink as your master link, apparently you need to squeeze the two plates (if you stood over the bike, one on left side, one on right) toward each other for release, at which point it's easy to slide the two halves of the master link toward each other along the line of the chain and the link drops apart or can be coaxed open. It helps to remove chain tension from the master link first. I used light pressure from needlenose pliers on the two sides, plus my wire tool from my other answer, to keep my hands clean, but apparently this is easy to do with fingers only. The master link on the left needs no tool to open. 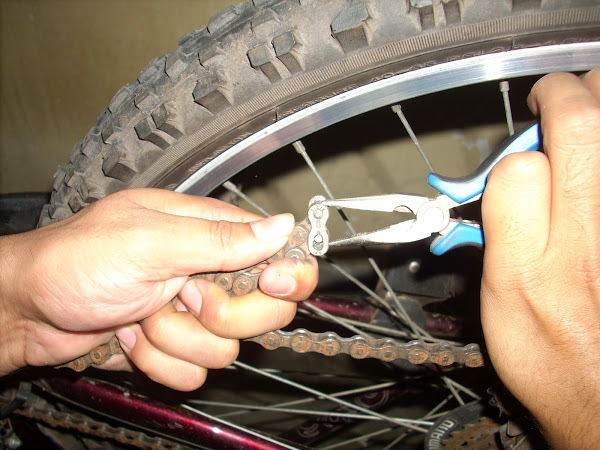 Instead you hold the chain either side of the joiner, put both thumbs on the side plate, and bend the chain towards you. This angles both pins and allows the clipon plate to clip off. Down side is that you're putting sideways bending forces on links which may be bad for the chain. If you have master link pliers, the link is trivially easy to remove. 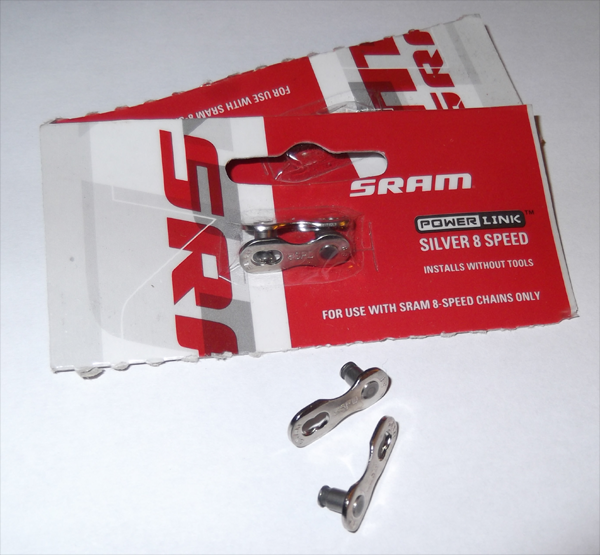 These are cheap and a worthwhile investment for any cyclist who does any kind of maintenance. Without pliers its possible but some tricks can make it infinitely easier. The key to making it easy is pinching the plates of the chain together. If you get this right, it will just fall apart. If you get a chance, try it on a brand new link and see how easy it is. These links can be damaged using brute force, and its entirely possible to hurt yourself using the wrong tools and high forces, so best to learn to do it right and not need force. First clean the link to remove any dirt and grit from between the inner and outer plates so they can move closer together. 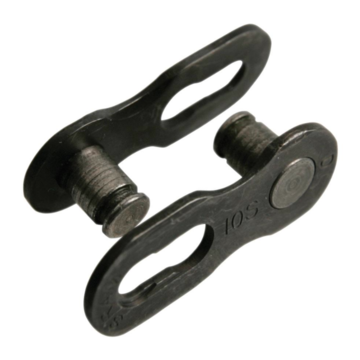 If there is any dirt between the inner and outer plates, link removal becomes very hard. Next pinch the plates together. If you are lucky, the plates will slide apart easily. If not, wiggle them around while pinching them. You may need to use a pair of pointy nosed pliers as shown by @kabZX, especially with a dirty chain, but the trick is in the pinching the plates together. Not the answer you're looking for? Browse other questions tagged chain tools or ask your own question. What should I carry on day trips for emergencies? 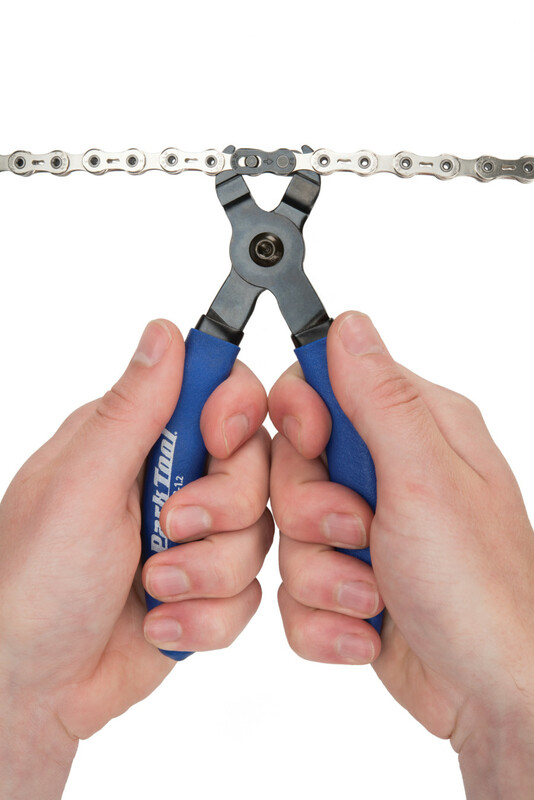 Do Master Link pliers help with SS / fixie chain assembly?